Bert Carson - writer: "Worth seeing. Not worth going to see." For the past three year, I've participated in InCoWriMo (International Correspondence Writing Month - One A Day Every Day February). Simply put, that means - for the month of February I agree to write one letter each day to someone who has agreed to do the same thing. A large percentage of the people who sign up for InCoWriMo are in for a month and that's it. And then there are others. People who are in for the long haul. Men, women, students, teachers, laborers... People from every walk of life and every corner of the planet. Men and women who write letters because they want to know people outside their town, their province, their country. They want to bond with other humans, and they've found that a pen and piece of paper affords them that opportunity. I'm fortunate to have stumbled on the InCoWriMo site and thanks to that good fortune, I have friends in Scotland, Thailand, Israel, Germany, Brasil, Korea, not to mention a couple of dozen in the United States, the most prolific being a young man in my home town, who I would have probably never met had it not been for InCoWriMo. Friendships nourish our souls. They draw us closer and give meaning to the statement, this is a global community. Today I read and replied to a letter from Timothy Birrell, a pen friend who lives in Lockerbie, Scotland. Timothy is an English instructor who is a natural teacher - that is, he teaches even when he doesn't intend to. In his letter, Timothy described his visit to the London Writing Equipment Show and summarized the event with a quote from Samuel Johnson, "It was worth seeing. Not worth going to see." As soon as I read that I wanted to know more about Samuel Johnson and, within minutes, I'd gone on line, purchased The Complete Works of Samuel Johnson and downloaded it to my Kindle. 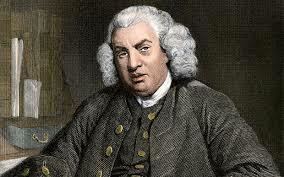 Now I'm immersed in Dr. Johnson. Who knows where that single comment from a long distance pen friend will take me? The world is not a CNN soundbite. It is a real place, filled with real people you can actually meet without leaving your home. For the price of a stamp and the investment of a bit of time, you can make a new friend, one you'd have never met any other way. If you want to jump in and you don't want to wait until February, check out A World of Snail Mail, specifically the link that says 5 questions 5 letters.